Encourage a wealth of birds to visit and dine in your yard by adding this Uncle Dunkel's Double Suet Feeder with Tail Prop to it. The wooden frame and traditional shape of this feeder bring a classic hint to your bird garden, while the bark overlay on the extended prop enhances the natural appeal. Lift the flat roof and place two standard seed or suet cakes in the reservoir, inviting clinging birds to the area. Plastic coated, metal rods keep each suet cake in place, and the 1" square openings allow birds to easily reach the treat. The generous prop provides birds a place to rest their tail for stability while dining, and its poplar bark exterior adds texture and a natural look. Use the attached cable to hang this feeder from a branch or tree, creating a striking feeding spot in moments. 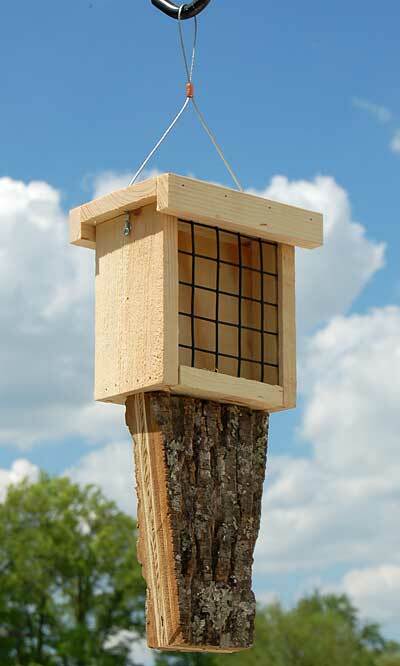 The 0.5" thick, wooden frame remains durable for many seasons, and the feeder is simple to refill. Bring a sylvan look to your bird garden with this Double Suet Feeder with Tail Prop. Made in the USA.